Apple announces the Apple Card – and it's a thing of simplistic beauty. We're used to seeing complex, shiny new devices unveiled at Apple launches. But at tonight's event, there was something different on the cards. Literally. The Apple Card is a new service built into the Apple Wallet app on iPhone, which aims to help people better manage their finances. But it wasn't just what the card can do (and we should note here that what we're told it can do is pretty darn impressive) that got the audience excited. The Apple Card isn't just a next-gen digital credit card built in to the iPhone, it will be available as a tangible product too. But what's the big deal? It's just a credit card, right? Wrong – this is Apple. And this credit card design is unlike any we've seen before. Gone are the features you so naturally associate with a credit card – card number, security code, expiration date or signature. 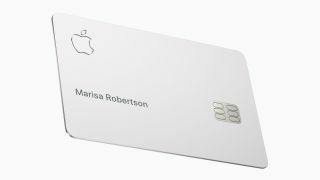 Instead, the luxury titanium card, in Apple's signature white, simply has the owner's name laser-etched on the surface, alongside an Apple logo and microchip containing all the details you need to make a payment. On the reverse are simply the names of Apple's partners on this project: Goldman Sachs and Mastercard. It is, as far as credit cards go, a thing of simplistic beauty. "It's the most beautifully designed card ever," says Apple’s vice president of Apple Pay, Jennifer Bailey. We know, we know, Apple is known for its sleek, sophisticated designs, certainly in recent years. So why the excitement? Well, we're not entirely sure, but there's something about this elegant, minimal design that we can't help but be hugely impressed by. Maybe it is, in part, due to the fact that despite its simple appearance, this stripped back design packs an impressive punch in terms of capability. Paired with Apple Pay, it allows users to manage their accounts directly through their iPhone. It also uses machine learning to colour code spend by category and location, as well as generate weekly and monthly reports to help users better understand their outgoings – a bit like 'millennial' cards such as Monzo. It is also reportedly going to have lower than average interest rates, no late fees and up to two per cent cash back on every purchase. Apple Card is set to be released to US consumers "this Summer", with no news as to when the rest of the world can expect its arrival. However, you can keep up-to-date with all the latest Apple Card news via the Apple website.